In the current chapter, we derive and discuss the fundamental principles of the finite element method (FEM). Therefore, the governing and constitutive equations are briefly recalled. By means of the method of weighted residuals (MWR), we convert the strong form of the equilibrium equations into the weak form. 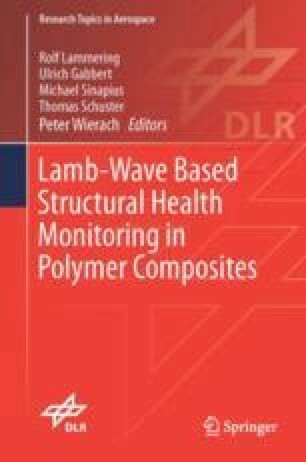 In the book at hand, wave-based structural health monitoring (SHM) approaches are investigated for thin-walled elastic structures that are augmented with a network of piezoelectric transducers. Consequently, the governing equations have to consider the coupled electromechanical relations. Since the fundamental idea of the FEM is the subdivision of the computational domain into small entities, the so-called finite elements, the discretized version of weak form is derived in the next step. To solve the semi-discrete equations of motion, we introduce two different time-integration methods that are used throughout the chapter. In conjunction with suitable mass lumping techniques, highly efficient numerical methods are generated. Finally, we also briefly mention different mapping concepts that are commonly used to approximate the physical geometry by means of the elemental shape functions. The basic ideas being discussed in this chapter are later also applicable to other, highly efficient numerical methods that are FE-based.